Awhile back I found a copy of The Castle in the Attic at our local Goodwill store and I put it in the cart. Before I left the store I had removed it from the cart, deciding that I would bypass it. Then I read someone else's review of it and instantly regretted my decision to leave this book behind. Therefore I was pleased-to-ecstatic to find another copy pop up at Goodwill later on. The best $0.99 cents I ever spent on a book! Some of my first reviews on this site were pathetically left at "I really liked this book!" or "I really hated this book!" I've tried to hone my skills as a book reviewer over the course of the past few years but I have to confess an inner urge to revert back to "the good old days" when I just left it at a "two thumbs up" where this book is concerned. Except saying that I would give this book two thumbs up seems particularly lifeless and uninteresting. I'd need to add a few thumbs, a few toes perhaps and a very wide grin. This book is fabulous and deserves heartily accolades from me (and the rest of the world). Ok, ok, so now I have to tell you WHY I liked it. Right!? Ever since I read The Code of Chivalry and decided that I would really like to encourage my son in his pursuit of knowledge regarding Knights in Shining Armor (always said in an excited voice with lots of exclamation points in the voice inflection) I have been on the prowl for good books on knights. I was, of course, attracted to this book because of the title and the cover art. It piqued my interest. But when I sat down to read it, oh! Elizabeth Winthrop had apparently also read the Code of Chivalry and wasn't about to back down on the terms involved. I truly cannot wait to share this book with my son(s). I am eager for the day that this book can be used for a read aloud and I will make a big deal out of that day. (Similar to the big deal I plan on making when we finally get to read The Mysterious Benedict Society.) It is imaginative, well-told, well-written, clever and, well, just plain good. 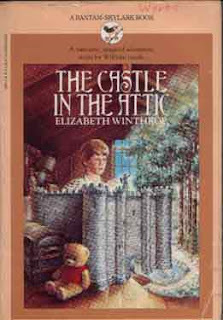 The Castle in the Attic is a keeper, a winner and a delight and I look forward to revisiting again many times over. I'm dubbing this 'a favorite' because it is! I am always on the lookout for great books! Thank you! I actually remember reading this book in my younger days. I recognized that cover. Crazy. I don't remember much about the book other than the fact that I liked it so much I read a number of times (in one summer even). This was a favorite of mine when I was younger. Great book. There's a sequel too called "The Battle for the Castle", though I haven't read it. But my son read both and enjoyed them. I've never heard of this one--I'll have to look it up for sure! This sounds terrific. I think my son would love it! My kids loved this book! My boys loved this book as a read-aloud. And if my memory serves me right we liked the sequel even better.